"Preservation is superfluous to our directive." The universe is a great big place. Robots probably live there and we want them on our side. Micronauts are a special type of robot that still pack a punch and IDW Publishing has their gloves on in Micronauts #1. The issue is written by Cullen Bunn, breakdowns by David Baldeón, finishes by Fico Ossio, Max Dunbar, Jack Lawrence and Baldeón, colors by David Garcia Cruz, Joana Lafuente, Thomas Deer and John-Paul Bove and lettered by Tom B. Long. 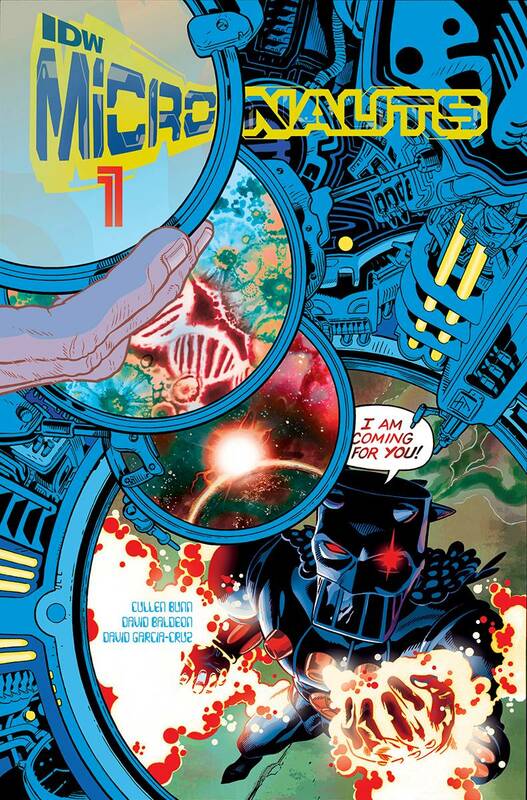 Bunn does really well to infuse Micronauts #1 with a Saturday morning cartoon feel throughout. There's definitely a pervasive sense of dread hanging over the galaxy in the issue that helps to give the book a sense of purpose, but Bunn doesn't let it overwhelm the reader. The story also borrows from other space stories with a ragtag group of would-be criminals and Bunn even manages to throw in some double-crossing for good measure. To achieve these ends, the dialogue is very snappy and light, refusing to bog Micronauts #1 down in material that could get really heady really quickly. Bunn establishes the pacing of the issue early and doesn't stray from it, giving the reader enough to grab onto and stay hooked throughout. Baldeón does a very sharp job with the artwork. His characters all sport very slick appearances and finishes that give the book enough of a futuristic feel to make their world believable. In fact, the illustrations pop off the page in a way that's underscored by laser blasts, energy swords and general space travel. The finishes by Ossio, Dunbar, Lawrence and Baldeón provide a futuristic sheen to the characters that reminds the reader of major technological advances yet to come. And the colors by Cruz, Lafuente, Deer and Bove are vibrant, giving each character and setting their own distinct looks that make them stand out from one another. Micronauts #1 is a very enjoyable first issue that hits the ground running and doesn't show any signs of letting up. Acroyear, Space Glider and Biotron are clearly getting into the thick of things and it'll be fun to watch them get out. There's a lot going on in the first issue, but Bunn manages to make everything feel digestible so that the reader doesn't get lost. The artwork by Baldeón and his crew is fantastic in that it gives the book a look that feels appropriate for the story. Micronauts #1 is a pretty fast-paced story that blends together popular elements of science-fiction in a tale that will continue to be exciting. Micronauts #1 is in stores now. I hope you do a re-visit for this book. I feel it has only gotten better.